Hoisted from the Archives from Fifteen Months Ago: Tom Mann and Norm Ornstein at U.C. Berkeley on May 18, 2012: U.S. Republican Party: "It's Even Worse than It Looks"
The Grumman F6F Hellcat was a carrier-based fighter aircraft conceived to replace the earlier F4F Wildcat in United States Navy (USN) service. Although the F6F resembled the Wildcat, it was a completely new design, powered by a 2,000 hp Pratt & Whitney R-2800, the same powerplant used for both the Navy's earlier Chance Vought F4U Corsair and the United States Army Air Force's (USAAF) Republic P-47 Thunderbolt fighters. Some military observers tagged the Hellcat as the "Wildcat's big brother". The F6F was best known for its role as a rugged, well designed carrier fighter which was able, after its combat debut in early 1943, to counter the Mitsubishi A6M and help secure air superiority over the Pacific Theater. Such was the quality of the basic simple, straightforward design, that the Hellcat was the least modified fighter of the war, with a total of 12,200 being built in just over two years. Hellcats were credited with destroying 5,223 aircraft while in service with the U.S. Navy, U.S. Marine Corps and the Royal Navy's Fleet Air Arm[N 2] This was more than any other Allied naval aircraft. Postwar, the Hellcat was phased out of front line service, but remained in service as late as 1954 as a night fighter. Grumman had been working on a successor to the F4F Wildcat since 1938 and the contract for the prototype XF6F-1 was signed on 30 June 1941. The aircraft was designed to use the Wright R-2600 Twin Cyclone two-row, 14-cylinder radial engine of 1,700 hp (1,268 kW) driving a three-bladed Curtiss Electric propeller. Instead of the Wildcat's narrow-track, hand-cranked undercarriage retracting into the fuselage, the Hellcat had wide-set, hydraulically actuated undercarriage struts which rotated through 90° while retracting backward into the wings, much like that of the earlier Chance Vought F4U Corsair. The wing was mounted lower on the fuselage and was able to be hydraulically or manually folded, with each panel outboard of the undercarriage bay folding backwards from pivoting on a specially oriented, Grumman-patented diagonal axis pivoting system much like the earlier F4F, with a folded stowage position parallel to the fuselage with the leading edges pointing down. Throughout early 1942 Roy Grumman, along with his chief designers Jake Swirbul and Bill Schwendler, worked closely with the U.S. Navy's Bureau of Aeronautics (BuAer) and experienced F4F pilots, to develop the new fighter in such a way that it could counter the Zero's strengths and help gain air command in the Pacific Theater of Operations. On 22 April 1942, Lieutenant Commander Butch O'Hare toured the Grumman Aircraft company and spoke with Grumman engineers, analyzing the performance of the F4F Wildcat against the Mitsubishi A6M Zero in aerial combat. BuAer's LT CDR A. M. Jackson directed Grumman's designers to mount the cockpit higher in the fuselage. In addition, the forward fuselage sloped down slightly to the engine cowling, affording the Hellcat's pilot good visibility. Based on combat accounts of encounters between the F4F Wildcat and A6M Zero, on 26 April 1942, BuAer directed Grumman to install the more powerful 18-cylinder Pratt & Whitney R-2800 Double Wasp radial engine in the second XF6F-1 prototype. Grumman complied by redesigning and strengthening the F6F airframe to incorporate the 2,000 hp (1,500 kW) R-2800-10, driving a three-bladed Hamilton Standard propeller. With this combination Grumman estimated the XF6F-3s performance would increase by 25% over that of the XF6F-1. The Cyclone-powered XF6F-1 (02981) first flew on 26 June 1942, followed by the first Double Wasp-equipped aircraft, the XF6F-3 (02982), which first flew on 30 July 1942. The first production F6F-3, powered by an R-2800-10, flew on 3 October 1942, with the type reaching operational readiness with VF-9 on USS Essex in February 1943. The F6F series were designed to take damage and get the pilot safely back to base. A bullet-resistant windshield and a total of 212 lb (96 kg) of cockpit armor was fitted, along with armor around the oil tank and oil cooler. A 250 gal (946 l) self-sealing fuel tank was fitted in the fuselage. Standard armament on the F6F-3 consisted of six .50 in (12.7 mm) M2/AN Browning air-cooled machine guns with 400 rounds per gun. A center-section hardpoint under the fuselage could carry a single 150 gal (568 l) disposable drop tank, while later aircraft had single bomb racks installed under each wing, inboard of the undercarriage bays; with these and the center-section hard point late model F6F-3s could carry a total bomb-load in excess of 2,000 lb (900 kg). Six 5 in (127 mm) HVARs (High Velocity Aircraft Rocket) could be carried; three under each wing on "zero-length" launchers. Two night fighter sub-variants of the F6F-3 were developed: the 18 F6F-3E's were converted from standard -3s and featured the AN/APS-4 radar in a pod mounted on a rack beneath the right wing, with a small radar-scope fitted in the middle of the main instrument panel and radar operating controls installed on the port side of the cockpit.The later F6F-3N, first flown in July 1943, was fitted with the AN/APS-6 radar in the fuselage, with the antenna dish in a bulbous fairing mounted on the leading-edge of the outer right wing; approximately 200 F6F-3Ns were built. Hellcat night fighters claimed their first victories in November 1943. A total of 4,402 F6F-3s were built through until April 1944, when production was changed to the F6F-5. The F6F-5 featured several improvements including a more powerful R-2800-10W engine, embodying a water-injection system and housed in a slightly more streamlined engine cowling, spring-loaded control tabs on the ailerons, and an improved, clear view windscreen, with a flat armored-glass front panel replacing the F6F-3's curved plexiglass panel and internal armor glass screen. In addition, the rear fuselage and tail units were strengthened, and, apart from some early production aircraft, the majority of the F6F-5's built were painted in an overall gloss sea blue finish. After the first few F6F-5s were built, the small windows behind the main canopy were deleted. The F6F-5N night fighter variant was fitted with an AN/APS-6 radar in a fairing on the outer-starboard wing. A small number of standard F6F-5s were also fitted with camera equipment for reconnaissance duties as the F6F-5P. While all F6F-5s were capable of carrying an armament mix of one 20 mm (.79 in) M2 cannon in each of the inboard gun bays (220 rounds per gun), along with two pairs of .50 in (12.7 mm) machine guns (each with 400 rounds per gun), this configuration was only used on later F6F-5N night fighters. The F6F-5 was the most common F6F variant, with 7,870 being built. The Hellcat first saw action against the Japanese on 1 September 1943 when fighters off the USS Independence shot down a Kawanishi H8K "Emily" flying boat. Soon after, on 23 and 24 November, Hellcats engaged Japanese aircraft over Tarawa, shooting down a claimed 30 Mitsubishi Zeros for the loss of one F6F. Over Rabaul, New Britain, on 11 November 1943, Hellcats and F4U Corsairs were engaged in day-long fights with many Japanese aircraft including A6M Zeros, claiming nearly 50 aircraft. 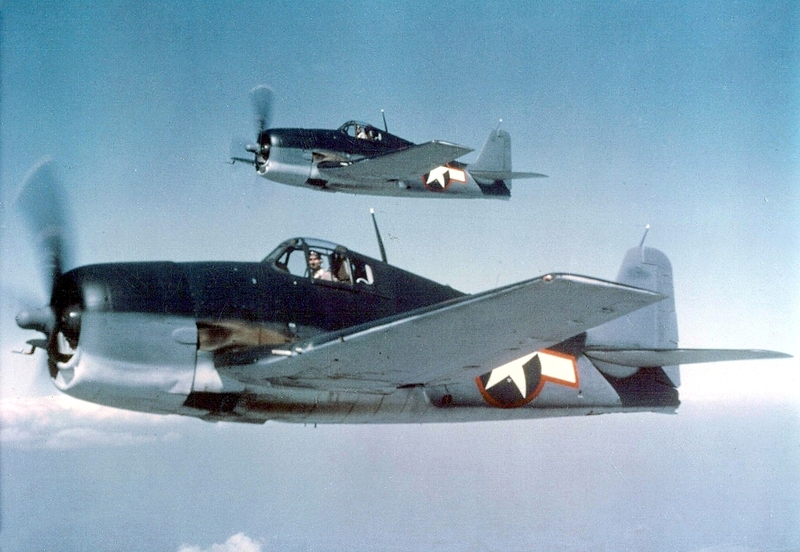 Hellcats were the major U.S. Navy fighter type involved in the Battle of the Philippine Sea, where so many Japanese aircraft were shot down that Navy aircrews nicknamed the battle "the Great Marianas Turkey Shoot". The F6F accounted for 75% of all aerial victories recorded by the U.S. Navy in the Pacific. Radar-equipped Hellcat night fighter squadrons appeared in early 1944. U.S. Navy and Marine F6F pilots flew 66,530 combat sorties and claimed 5,163 kills (56% of all U.S. Navy/Marine air victories of the war) at a recorded cost of 270 Hellcats in aerial combat (an overall kill-to-loss ratio of 19:1 based on claimed but not confirmed kills). The aircraft performed well against the best Japanese opponents with a claimed 13:1 kill ratio against the A6M Zero, 9.5:1 against the Nakajima Ki-84, and 3.7:1 against the Mitsubishi J2M during the last year of the war. The F6F became the prime ace-maker aircraft in the American inventory, with 305 Hellcat aces. The U.S. successes were not only attributed to superior aircraft, but also from 1942 onwards, they faced increasingly inexperienced Japanese aviators as well as having the advantage of increasing numerical superiority. [N 6] In the ground attack role, Hellcats dropped 6,503 tons (5,899 tonnes) of bombs. The U.S. Navy preferred the more docile flight qualities of the F6F compared with the Vought F4U Corsair, especially during carrier takeoffs and landings, and the F6F remained the standard USN carrier-borne fighter until the F4U series was finally cleared for carrier operations in late-1944. In addition to its good flight qualities, the Hellcat was easy to maintain and had an airframe tough enough to withstand the rigors of routine carrier operations. Like the Wildcat, the Hellcat was designed for ease of manufacture and ability to withstand significant damage. The U.S. Navy's all-time leading ace, Captain David McCampbell USN (Ret), scored all his 34 victories in the Hellcat. He once described the F6F as "... an outstanding fighter plane. It performed well, was easy to fly and was a stable gun platform. But what I really remember most was that it was rugged and easy to maintain." During the course of World War II, 2,462 F6F Hellcats were lost to all causes; 270 in aerial combat, 553 lost to anti-aircraft ground and ship-board fire, and 341 were lost to operational causes. Of the total figure 1,298 were destroyed in training and ferry operations, normally outside of the combat zones.